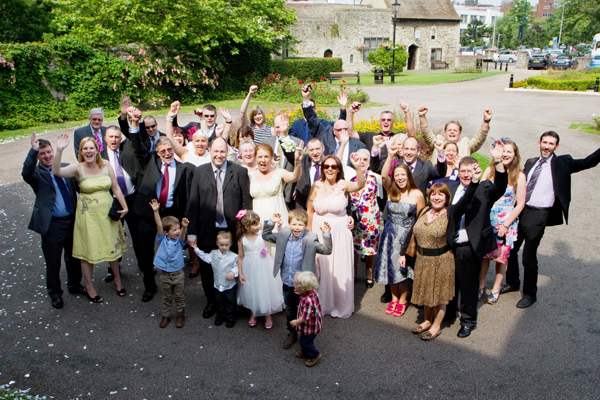 Jez and Sarah Burbidge, 27th July 2012, Archbishops Palace, Maidstone. We had been together for eight years, and had always joked about not getting married. We'd had an amazing eight years together and were made closer when Jez had a major motorbike accident. He was air ambulanced to London, was in a coma and hospital for months. This made us think in a different way. We were on holiday in Scotland in 2011 when we passed a jewellers and Jez said 'that's a lovely ring '. We went for a drink to talk about it and said 'lets do it'. Jez said he'd keep the ring and surprise me a later date. We went back to the hotel and he surprised me then! We didn't want a big wedding, or a long engagement. We wanted to surprise everyone. We started planning the wedding in April 2012 and got married three months later in July. We made a list of what we wanted and who to invite. Everyone, of course, has an opinion of what you should have or should do. Keep in mind its yourwedding. We wanted a small wedding, with a party for friends and family afterwards, so booked our favourite pub in Ryarsh and had hog roast and a barrel of Jez's favourite beer to start the night off. Jez had two stag nights; one with family, and one with friends, I'm assured both were classy. One was into London and the other to Southend, I think curry and kebabs were eaten too, as I said classy! I went to a spa hotel with my sister for the weekend and we did nothing but swim, sit in the spa and laze around. We knew we wanted a civil wedding venue, and made initial calls and visits to some favourite spots. We were still thinking about it when an open day came up at Archbishops Palace in Maidstone. We had two previous visits where we seemed to be on a treadmill of what the venue wanted and not what we wanted. The Archbishops Palace is a beautiful building, and has a lovely hidden herb garden for photos. Helen England took the most amazing photos here. The staff at the Archbishops Palace were friendly, professional and calm, not only going through booking but on the day too. The wedding day was exceptionally warm and sunny, well into the late 20's. We laughed, ate and danced with our friends and family, it was a great day. It was a day that was just so right and meant to be. By keeping it simple there was nothing to worry about and everything went to plan. I wore a long cream dress from Monsoon. I loved it and was so comfortable all day and night. Jez had a new suit from Marks and Spencer. I also knew that my feet would ache in heels all day, so my 'something blue' was a pair of blue converse, that I changed into for dancing. I made my own flowers from sweet peas I had grown in the garden, they were my Grandma's favourite flower. I wore my Nans wedding ring too, so they could both be part of our day. When we were looking for a car we were amazed at the prices. I rang a local firm, Kings Hill cars and asked for a list of their options. We booked a new black Mercedes that came with a great driver, all suited and booted on the day. Believe me a new, air conditioned car in the height of summer was a good choice over a vintage car! We decided not to splash out on table decorations and made the decision to send a donation to our favourite charity; the air ambulance. When we told everyone they were really pleased. We had a single red rose on each table. White linen on the tables. White candles later on. We decided not to go for a cake and made a donation to the air ambulance. We didn't want to dance in front of everyone and it makes me blush thinking we had to do this, so we didn't! We did round the evening off with all our friends singing to 'Come on Eileen'. We created our own play list for the ceremony, full of Rat pack and Motown hits, and another for during the meal, we put these on my ipod (we made CD copies as back up, just in case). We had a DJ in the evening who also followed a playlist we had emailed him before the wedding, full of the tracks that we love and our friends too. We wanted to celebrate with a party. Our best man was my husband's best friend (also a biker) who when asked to hand the rings over passed a metal washer from a bike! We drove to France in our old MG and had a week in a gite. Warm and sunny, with lots of cheese and bagettes. This is a wedding between two people, share the load. We made a list of what we wanted, what was a priority to do first, next etc, who to invite, and set a budget. We didn't want to be in debt or not be able to pay the mortgage afterwards! We split the list between us, and got cracking. I had a make up lesson at Lancôme in Debenhams, I bought most of the products and practised once a week for the last month. It was great to feel it was a more natural 'me' look, than someone Jez wouldn't recognise! I went to my usual hair dresser who did a lovely 'up do' hair trial, we tweeked this, and I went again on the morning of the wedding. We had a few children at the wedding ranging from 2 to 6yrs. We got my mother in law to make party bags for each child to keep them amused at the table. She put in colouring books, pencils, toys, stickers etc. Its a great idea and they loved them. Its worth considering having a later food option too, we had some guests that only came to the evening venue and they loved the hog roast rolls. We booked a local hotel to stay in after the wedding, The Hadlow Manor, and left one day between the wedding and the honeymoon. This gave us the chance to have a lie-in at the hotel, have a late breakfast and then pop back to the pub to say thank you (and pick up anything that had been left behind!) before going home to suitcases packed ready for the honeymoon. Venue –Ceremony at Archbishops Palace. Maidstone. The Duke of wellington pub in Ryarsh, for our hog roast and party, John the owner, caters for lots of weddings and his experience and advice was invaluable. Grooms suit –Marks and Spencer. Flowers –I grew my own sweet peas in the garden. Entertainment – We had a DJ in the evening who also followed a playlist we had emailed before the wedding. Transport –Kings hill cars. Maidstone.